Yesterday was a scorching day with highs of 22 degrees, minimal breeze and plenty of sunshine which did turn hazy by the afternoon, in fact it was quite cloudy at 4pm. At work I saw plenty of Holly Blues and Brimstones and one Argyrotaenia ljungiana was a year first sighting. By 8.30pm the trap was lit up and the sky was clear again, I can't remember the last cloudy night we had! 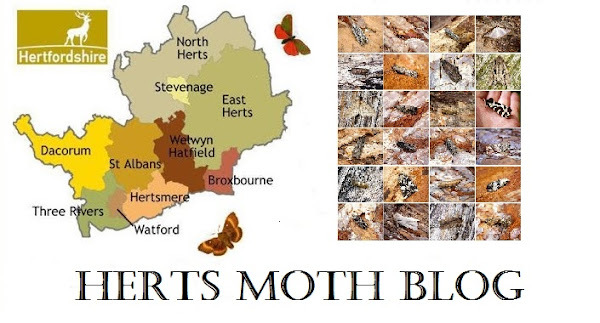 16 moths of 9 species was reasonable for my garden this time of year as we cross over from Orthosia's to move varied families of moths, namely the Prominents and Geometers. New for year were Garden Carpet, Waved Umber and Mompha subbisttrigella. The species list stands at 35 for the year. Today has been even warmer at just a shade under 24 degrees here, in fact as I write it is still 23 degrees and promises to be a cloudy but possibly stormy night. Nevertheless the trap is going out again as I have so much catching up to do it is quite absurd! Tomorrow night will see me on my third field trip of the year. Good luck all over the next few nights.